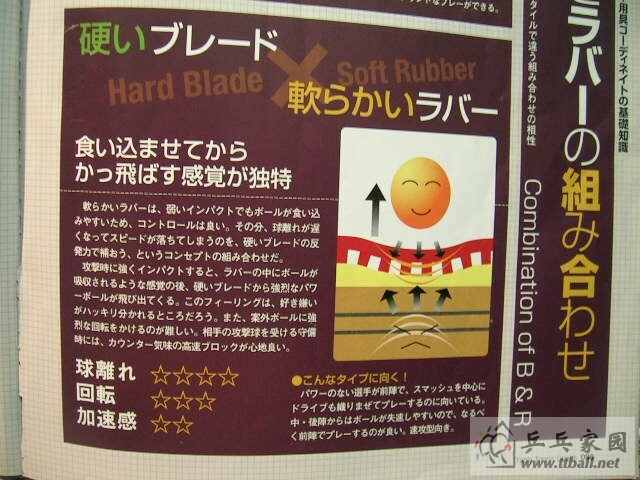 Hard Rubber on Soft Blade or Soft Rubber on Hard Blade? 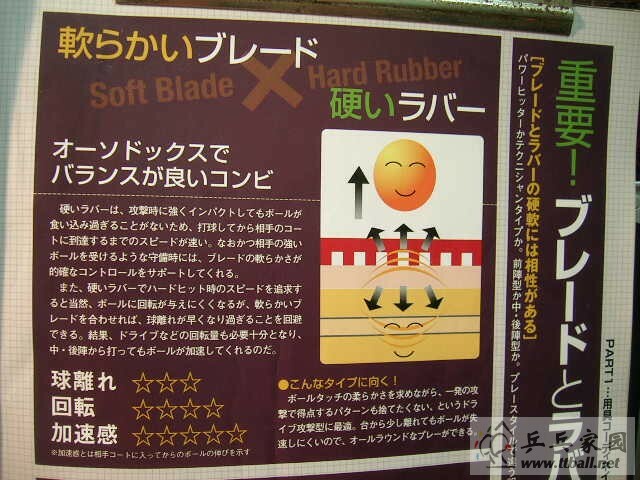 Post subject: Hard Rubber on Soft Blade or Soft Rubber on Hard Blade? Are there any advantages and disadvantages to these two types of setup? What type of players would each favor? These are just examples and you can respond based on your own personal experience. Soft rubber on hard blade for me. Never liked the feel of a hard rubber on a soft blade for touch and don't like how soft & flexy blades vibrate. I've never felt that a soft flexy blade was any better for looping. Used to be a popular claim. Keep in mind too that for a blade, "soft" doesn't necessarily mean "flexy"
Post subject: Re: Hard Rubber on Soft Blade or Soft Rubber on Hard Blade? I'm the opposite of Silver. Hard rubbers, soft blades all the way for me . As a OX LP player, the soft blade gives me wonderful feel close to the table. I play a semi-hard rubber on the forehand as the blade has a strong vibrate and feel - seems to gel nicely. Don't recommend Hard/Hard or Soft/Soft. but blade choice is always about comfort. I'm the opposite of Silver. I always found that soft rubber on soft blade makes me play a very very brushy loopy game with nice chops and pushes mixed in. Like a more 2-winged looper and all-round player style of play. Hard rubber on a hard blade I can't spin the ball enough on serves, but I can loop-kill or loop-drive and have a decent block game. Pushing and chopping I can't do anything as I dump the ball into the net more times or push into the wall. What works for me is medium-hard / hard rubbers that are tacky + fast or grippy + slow on a soft blade. This post from Zeio is the best post for this, imho. Sorry for link to another forum. I myself prefer hard rubber on soft blade. Here is the deal. 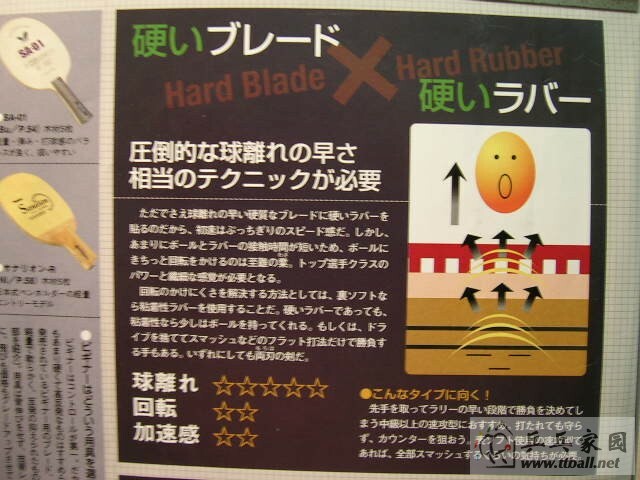 According to the Japanese magazine Table Tennis Kingdom, there are three areas of concern in a setup - ball separation(inverse of dwell), spin, and kick, which are tied in with the hardness of the rubber and the stiffness of the blade. As the hard rubber does not bite excessively onto the ball on hard strokes, shots tend to rebound quickly to the other court. Yet on passive strokes when under pressure, the flexible blade provides adequate control. One downside of hard rubbers is that applying spin would become more difficult, which could be remedied with flexible blades, transforming this type of setup into a mid-range looping machine and beyond. Ideal for players who seek a soft feel yet do not wish to compromise on hitting winners. Best for all-round offensive play slightly away from the table. The soft rubber gives sufficient bite with good control, even on soft strokes. The blade provides the stiffness to make up for the slower rebound. On hard strokes, this type of setup gives off the sensation of the ball getting sucked into the rubber before being catapulted violently, whether you like it or not. On the other hand, it is surprisingly difficult to impart strong spin on the ball, but in return it allows for a good feel on fast blocks when on the defensive. Ideal for players lacking power who stick to the table. Best for fast-attack play close to the table with some driving. Apparent loss of speed once away from the table. The simple combination of hard rubber and stiff blade brings about a speedy rebound as different as night and day. But the short contact time between ball and rubber makes imparting spin an immense challenge on the player's skills and touch. The issue of spin can be resolved by the help of tacky rubbers for inverted players. With the tackiness, the least those hard rubbers can do is hang on to the ball. Else, consider crossing out drives from the equation and just live with smashes and flat hits. Whichever way you pick, it is a double-edge sword. Ideal for fast-attack players intermediate and above looking to finish off quick who do not back down even when pressed. Non-inverted players should be prepared to finish the match entirely with smashes. Soft rubber and soft blade may make for a controllable setup, but the rebound speed leaves a lot to be desired. Relying on offensive power to gain points would be extremely difficult. Rather, attention should be paid on placement and lines of play for this type of setup. For defensive play, the high control would result in very consistent chopping and blocking. Choppers in particular would find it easy to produce shots where the ball sinks deeply into the rubber but in fact no spin is imparted on the ball. Nonetheless, the lack of power would be evident on counterattacks. Those relying on variation of pace between offense and defense are recommended to use non-inverted and special rubbers. Ideal for offensive players with tricky loops and blocks, and defensive players who punish their opposition by changing up spin with the use of special rubbers. Recommended for beginner and intermediate choppers. Very informative post BeGo. I too am leaning towards Hard Rubber on Soft Blade (1st setup) as it seems to be the most balanced. I think the other 3 setups would require a skill level greater than intermediate. Ditto SuperHappyFunSlider - Semi hard rubber on FH, OX pips on BH, on a soft blade offers perfect control and feel for me! My opinion, the Harder the sponge the harder the blade needed as backing to really actuate or drive the sponge. To me hard sponge on a soft blade is probably wasting part of the capability of the sponge. But there is a lot of hazy semantics here, as to what is meant by hard, soft, flexy, stiff, topsheet, sponge, etc. Rubber and sponge never harder than the blade behind it, so, without points of reference, the score is pointless. I've tried using DHS H3 on my Firewall+ and it feels like a broken blade with the sound of, like a plank dropped on the floor. I replaced it with Butterfly flextra, it feels more solid on contact, especially when the rubber bottoms out. You can literally feel the ball in you hand. And it produces a sweet clicking sound which is way better than a dropped plank on the floor. No. H3 is hard, hence I've replaced it with Flextra which is soft. What I'm trying to say is, if you use hard rubber on a soft blade (not necessarily flex), especially balsa like FW+, it feels broken and sounds like a dropped plank. While soft rubber on soft blade produces better feel on the ball. Sorry for the misconception.